I realize that I keep sticking food in a jar and publishing it here on Patty Cake’s Pantry. The reality is that I have begun to use mason jars more than I use my plastic food storage containers. Seriously, you have no idea how often I use them. I even take leftover soup to work in mason jars. I store fresh berries and cut fruit in mason jars. I don’t publish all of these ideas here, but every once in a while, I have another idea that I believe warrants publication. This is one of those. I never ate a jicama until I was an adult. In fact, I was a college graduate before I even heard of a jicama. If you’re like me, then let me tell you that the jicama is worth getting to know. Though its flesh resembles a waxy potato, jicama is actually a member of the bean and pea family. In fact, one of its other names is the yam bean. A primary difference between the jicama and other beans is that the root of the jicama plant is what is eaten. The bean pods and seeds are highly toxic, but the tuber is safe to eat. In fact, the Jicama is low in calories, high in fiber, and generally good for you. A few years ago, a coworker introduced me to one of her traditional ways to eat jicama. It was a simple 4 ingredient recipe for a very tasty salad that included cucumbers, jicama, chili seasoning, and lime juice. For me, it was love at first bite. This week, as I was preparing the salad, I began tossing ingredients into a jar. I realized that it made a rather attractive layered salad. The down side to this salad is that it shrinks in the jar as the cucumbers begin to release their liquid, so it must be eaten within a few hours of being made in order to continue to look attractive. Give this salad a try, with or without the mason jar, and let me know what you think. 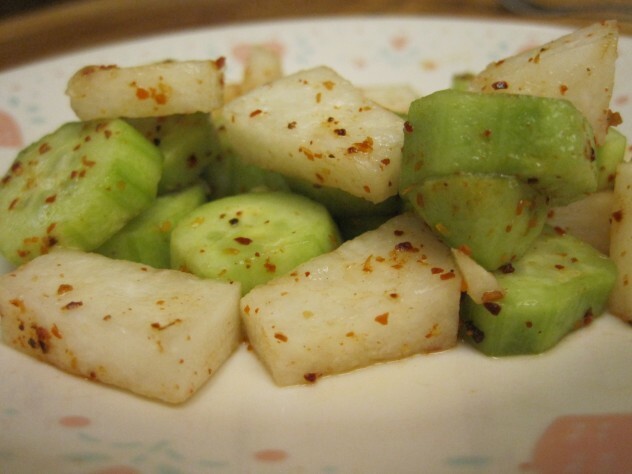 Jicama, a waxy tuber, is paired with cucumber, chili seasoning, and lime juice to make a healthy and refreshing salad. 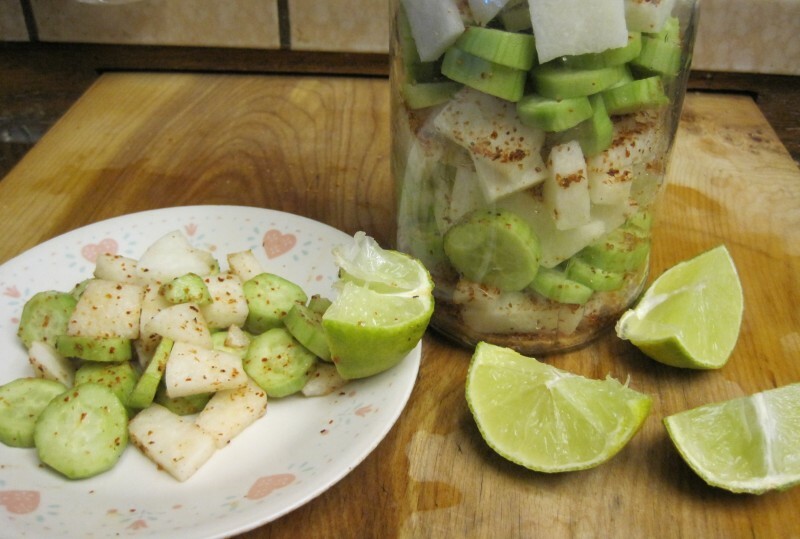 If you are packing this in a jar, add lime juice at serving time. 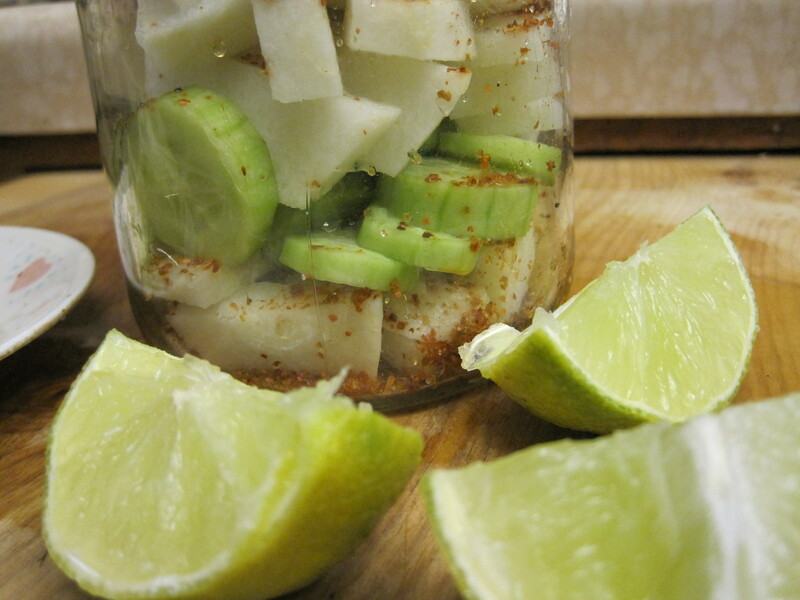 Top cucumber with ⅔ cup of jicama and sprinkle with chile seasoning again. Add another layer of 1 cup cucumber on top of this layer of jicama. Top with the remaining jicama and more chile seasoning. Place lid on jar and store in refrigerator until serving time. When ready to serve, shake jar vigorously to toss the salad. Serve with lime wedges and additional chile seasoning. Put cucumber and jicama into a shallow bowl and toss well. This looks delicious and I’m ready to take a bite…oh wait, it was a picture. I thought I saw some green papaya in it and had to look at the recipe for the ingredients. Do you think some papaya would be good with the cucumbers? I know it would be good with the jicama. Green papaya is a little tough when it’s raw, but there’s a Thai recipe that uses shredded green papaya and some other ingredients that’s delicious. Have you ever shredded jicama and butternut squash on top of a salad? People are adamant that there’s cheese on the salad because the combination looks like colby jack cheese. Gotta try the cheese look. And thanks for replying. I’ll hold off on the papaya. Cut mango or pineapple goes well in this salad, too.